The latest and greatest buzzword is Innovation, (henceforth to be known only as the “i” word in this forum.) It seems that our senior executives are now talking-up the “i” word which is not a bad thing I guess, however it all stops at the talking. A while back, the phrase the “bureaucratisation of Innovation” (darn, I said it) popped into my head. Now I don’t know where it came from, whether I unconsciously plagiarised it or I dreamed it up myself it matters not, it’s appearance was timely. It comes at a time when the use of the “i” word in business and government is at its peak. I’ve known few words during my previous life in the public sector that have invoked such consternation, misunderstanding and outright fear. When we speak of the “i” word, we speak in glowing terms of the potential it offers but we forget the other side of the implementation equation involving the change it engenders, and as a result we go no further than talking about it. We’ve all heard bureaucrats in government spruik the “i” word and tell us that we need to think differently and that we need to be challenged, however when the challenges come, very little changes in the modus operandi of dealing with them. We default to the linear and structured approaches of the past. New and creative approaches are shunned and when this occurs, the “i” word is little more than a buzzword. The use of the “i” word in many cases amounts to little more than a form of ‘bureaucratic chicanery’ in which words, glossy brochures, heavily moderated social media and talking about action, substitute for action itself. The Federal Govt’s not so recent 2020 summit proved a nice example of the bureaucratisation of the “i” word. I just don’t know that many of the thousands of ideas generated there have been appropriately harvested or moved to impactful action, but wow, was the event talked up! When you can look under desks in organisations and see rolls of butcher paper containing post-it-notes of ideas gathering dust, you know that the “i” word is a buzzword. If we can put the “i word” into enough speeches, documents, ppt presentations and action plans though, we must then be doing the “i” word. Right? In environments where everything is first viewed through a lens of risk it is extremely difficult to gain the permission required to undertake the thinking, experimenting, probing and prototyping needed for the “i” word to happen. In large organisations too, those more likely to challenge the status quo and attempt to do things differently are the ones most likely to be sidelined and disempowered, and again where this happens the “i” word is just a buzzword. So, while Rome continues to burn and our intractable problems remain intractable, our senior bureaucrats continue to talk innovation. 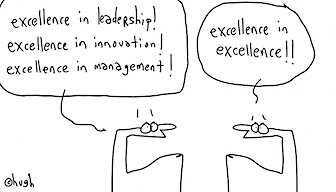 The cartoon exactly defined the Capability Maturity Model – Great ! The 2020 summit was merely “aspirational”. The day we rely on bureaucrats to actually do anything we are doomed, but I wonder why you wait for them, and expect them to do anything. Agree 100% Ian, and trust all is well over the border there.